Describe your Lovie Finalist project. What’s the elevator pitch? "Raoul Wallenberg Academy inspires young leaders to act with compassion, just like Raoul Wallenberg—a Swedish diplomat who sacrificed himself during WW2. In our digital age, a single tweet can bankrupt a company or even start a war. 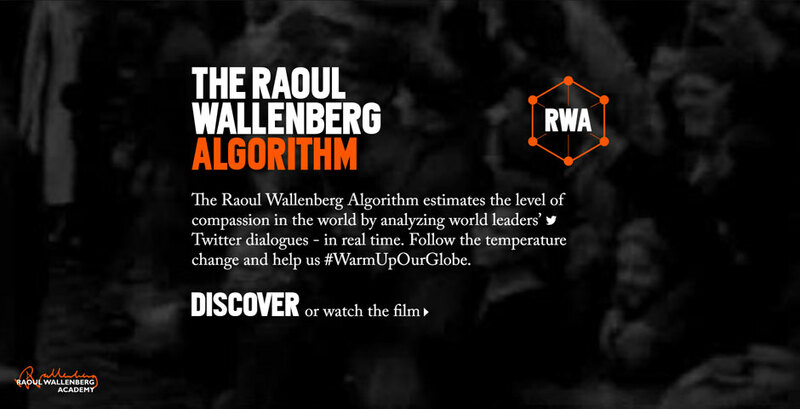 To demonstrate the importance of compassionate leadership, The Raoul Wallenberg Algorithm processes hundreds of tweets every day from 300 world leaders. The Watson AI analyzes the tweets’ tonality and what emotions they broadcast to the world. Combined with the number of followers, the algorithm calculates the current compassion temperature of the world. The compassion temperature scale is a symbol to show our leaders the importance of compassionate leadership." What inspired this particular cause as the subject of your work? "The same evil forces that swept through the world during WW2 are on the march again. In Europe and the USA we see politicians gaining power and spreading hate to the world using social media as their megaphone. We wanted to show what you write on social media has a real effect in the real world." What real-world impact were you hoping to make with this project? "Raoul Wallenberg Academy is a small nonprofit organization with a low public awareness. The goal was to make people understand why they exist and the importance of what they do. During the week of the launch, Raoul Wallenberg Academy was featured in all the major media houses in Sweden: TV, morning shows, newspaper, radio and online. The other main objective was to make people think twice before spreading hate online and to try to be positive instead." Did your team have a specific “breakthrough” moment when conceiving or executing this project that you can share? "When we created the very first prototype to test our idea, we saw the world changing color in front of our eyes—from purple to blue—after a tweet from Donald Trump. We all had goosebumps, our hypothesis was correct and we knew that the project would have a great impact for Raoul Wallenberg Academy." "Twitter was essential for our success, the world’s biggest open discussion forum. It has become an icon when it comes to debates and more or less every day a tweet makes it into the news. The Watson AI helped us to analyze the massive amount of data and set the tone of the text." In Europe and the USA we see politicians gaining power and spreading hate to the world using social media as their megaphone. We wanted to show what you write on social media has a real effect in the real world. Sites for charities and charitable organisations whose primary purpose is helping people or other worthy causes.